Whilst high energy exercise is important for improving cardiovascular health and helping to maintain overall fitness and well-being, it is also important that we maintain and improve our flexibility, range of movement and posture through gentle, controlled exercise. With gentle exercise you take away the speed, enabling you to focus on the individual exercises and feel the movement within the body. Gentle exercise may at first glance seem easier however, because it takes away the energy and momentum, your body is completely in control and has to work harder, whilst also having to manage individual movements over a longer period. Our latest DVD, Wheel-Flex Flex and Stretch, being relased on Sunday 3rd December is a gentle exercise programme. 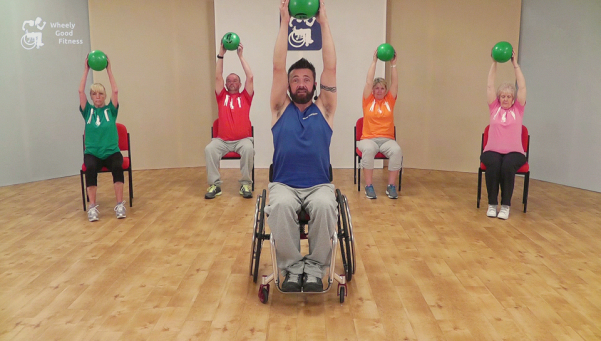 Created for all abilities, it provides a controlled workout to improve and maintain the body’s range of movement, flexibilty, co-ordination, motor skills and posture. The programme works through the whole body in sections, providing you with 100 minutes of exercise to choose from, depending on how you are feeling each day and your own abilities. The DVD is broken down into 6 sections: Upper Body, Leg Work, Balls, Bands, Weights and Flexibility. You can choose to do the complete programme in sequence as one complete workout, or you can work on a different section each time, depending on how you are feeling on any particular day. Upper Body – mobilising the upper body, working on range of movement, co-ordination, posture and stretching. Leg Work – mobilising the legs, working on range of movement, co-ordination and stretching, through seated and standing exercises. Where standing work is performed, there are alternative seated exercises demonstrated that can be performed by individuals who are unable to or do not wish to stand. Balls – performing upper and lower body movements with the use of a ball to provide focus and resistance. Bands – using bands to provide resistance for upper and lower body exercises. 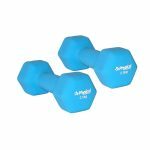 Weights – upper body exercises performed with weights to improve muscular strength and tone, whilst also challenging co-ordination and motor skills. Flexibility – this section is intended to improve and maintain overall flexibility by performing a range of upper and lower body stretches. This section finishes with a few minutes of relaxation to help restore and focus the body. For the majority of the workout programme, no equipment is needed to take part in the exercises other than a chair however, there are three sections where you will require specific equipment. Balls – in this section a soft pilates ball is used to provide resistance and focus during the section. 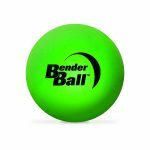 In the DVD we use a Bender Ball*, which is an 8” soft inflatable ball, although there are many other types available. The ball needs to be soft, as during the workout you need to squeeze the ball. It also needs to be lightweight enough to hold easily during the workout. Bands – for the band section we use exercise bands, also referred to as resistance bands, and these are used to provide resistance to the muscles during this section. The bands are available in different strengths, indicated by their different colour and can be bought a sets of mixed strengths or individually. In addition, the bands come in a variety of lengths for you to choose from for your needs. The stronger the band, the less it stretches and the more resistance it gives, requiring you to work harder against the band. However, the stronger, more resistant band can also make it easier to assist lifting your leg, for example, where you may have weakness, as it provides more support. You may wish to consider a mixture of band strengths so you have a choice during your workout. For the right band length, the band needs to be long enough for you to perform the exercises comfortably. Too short, and it will be difficult to hold and potentially have too much resistance. As a guide, we suggest a band length that is around twice the length of your inside leg, which for most will probably be around 1.5 metres. There are similar products available in the form of tubes instead of bands, and have handles attached. These are often preferred by people who require something solid to wrap their fingers around. However, these are of fixed length, as the handles are attached to the tube, and so not adjustable. We have found that people tend to use a shorter length tube than they would if using a band to get the required resistance. Weights – to provide resistance in this section we use dumbbells also referred to as hand weights. There are many different brands available; some have a smooth plastic coating, others a textured coating and some are metal. In addition, the central bar can be smooth, shaped or ribbed. Smooth plastic are easiest to keep clean however, textured coatings can help with your grip, as can those with ribbed or shaped central bars. Specialised weights are available for people who may have limited grip or difficulty controlling their fingers. These can have velcro straps, gloves attached and also wrist weights. Again, like the bands, weights can be bought as individual pairs of a chosen weight or in sets of mixed weights. If you wish to progress over time and increase your weights, then buying a set of weights can work out to be the cheaper long-term option. Depending on the make, sets can be made up of a mixture of 0.5kg, 1kg, 1.5kg 2kg, 3kg and 4kg. If you are new to exercise or using weights and unsure what weight to start with, try gauging it with something at home – a standard tin of beans, for example, is just under 0.5kg. * our use of a specific brand of equipment and supplier is as a result of this being the equipment available at the time of filming and for example only and should not be viewed as a product endorsement or recommendation.